Some of our patterned and striped faux fur cushion covers have very distinctive designs, and we have attempted to show the pattern or design of the fur fabric in our photographs. Hopefully they will give you a better idea of the size of the design, or if the pattern is repeated frequently, or randomly, throughout the fur cushion. You could also look at the images of our faux fur throws for further clarification as these are also produced from exactly the same designs. Beige Lynx is one of our most popular designs. 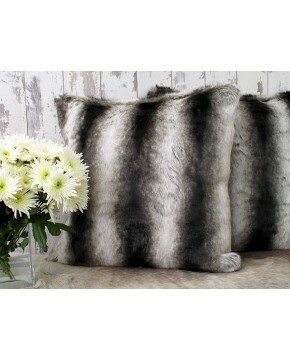 The faux fur cushions are perfect for bedrooms or living rooms. Whites, beiges and brown in a striking design. Our Black Wolf faux fur cushions comprise black and grey fur in a striped design. Very competitively priced and ideal for many situations. A medium length faux fur. A very competitively priced faux fur cushion or cushion covers. Medium length fur, striped, with greys and brown colouring with tan highlights. Luxurious looking and yet low priced faux fur cushions and cushion covers. A subtle combining of white brown and tan fur make this an eyecatching design. These medium lengthed faux fur cushions are striped. Our Mink faux fur cushions and covers are a mix of golden wheat colours with brown roots. Long-haired, soft dense fur. A popular choice for many applications. Silver Brown Chinchilla faux fur cushions are soft and luxurious; striped with a silvery grey and very dark brown, almost black. Great to highlight a plain black or grey sofa or chair.